The two aren’t poles apart at all but there’s a subtle and often ‘goes-without-saying’ air about usability in connection with user experience. In this blog, we will take a closer look at usability and how it impacts user experience and why a great UX design doesn’t always mean your app has implicitly passed the usability test. The idea is great. Implementation? A couple of months later, you are trying to use the actual iOS app in test mode and you grumble as you try to get your finger to tap on that amazing-looking icon or strain your eyes to read some small font on a large-screen device. This is where usability comes in. 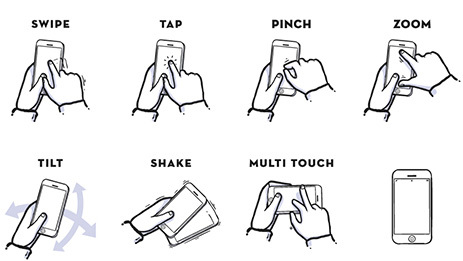 No matter how great the artwork and the ideas in UX design, at the end of the day, the user shouldn’t have to struggle to use the screen because the design didn’t scale up to the screen-size in development or because adequate attention wasn’t paid to the space given for a finger gesture. Simply put – Intuitiveness means the user knows what to do, usability means the user does it in the first attempt. Yes, that’s right. Neither your design/development team nor your QA team should give the final verdict on the app’s usability. Rope in someone who is seeing the app for the first time. People who have already been in the project subconsciously know too much about the app to recognize genuine usability issues.For example, you know what a button is supposed to do so even without your realization, you will subconsciously try various actions aimed at seeing the expected outcome – this is not true for new users who don’t know what they are supposed to see next. An exception to this rule is covered in the next point. In most cases of apps that have a good UI/UX design to start off with, the straightforward flow is what everyone focuses on at the prototype level. And that is not wrong because not every functional scenario can be covered with a mock-up. It is imperative that the dev team has an eye for UI/UX to ensure that the app gracefully extends design to all scenarios. However, lapses might occur and these can be caught in usability testing where you check if all scenarios are as easy to use as the default scenario. Scenario-testing can be done by people already in the project and not necessarily by new people – because only the former will really know what scenarios are possible. Users coming back to your app to perform the same tasks over and over again (e.g. Shopping for apparel) is a great indicator of good usability. Usability spells convenience and people wouldn’t be coming back if they can’t perform regular tasks quickly and easily. User engagement has been found to be good even in utility apps that don’t have that great a UI or UX but where it is very easy to complete mundane tasks like paying bills! That’s how important usability is and how it stands its own ground irrespective of design finesse. One important aspect of beta testing or usability testing is that you should choose your user group carefully. Choose a sample of your actual target audience. The group needn’t be too large but it must be an active and focused one whose observations reflect real-world contexts of usage. Ask each member to provide their feedback individually rather than in a group. This will ensure the collected opinions are uninfluenced and as diverse as they can get. This in turn, gives you a wider perspective of how the app is faring in the usability test. Filtering of feedback is equally important. Isolated one-off points of feedback and feedback that lacks knowledge of business-driven decisions are best left unused. For example, you may get feedback that says the app must be free for the first version but if there’s a good reason you have a price tag, let it stay. That was a quick write-up on usability based on real experiences. Do you have insights based on your own experiences as well? Leave your comments in the section below. How Will The Millennial Workforce Shape Business Technology? Where are technology skills heading in 2016? Can Smartphones Create A Better UX Experience?